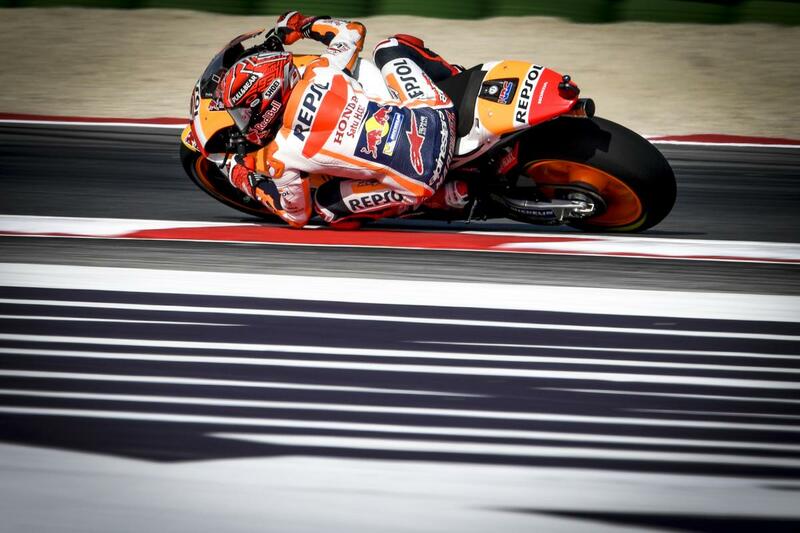 Marc Marquez (Repsol Honda Team) set a flurry of hot laps at the end of a sunny FP3 to take control of the march to Q2, heading the top ten on combined times from a late-charging Maverick Viñales (Movistar Yamaha MotoGP). Friday’s fastest, Danilo Petrucci (Octo Pramac Racing), took third with his laptime from Day 1. Cal Crutchlow (LCR Honda) was an improver on Saturday to take fourth overall, ahead of Championship leader Andrea Dovizioso (Ducati Team) locking out the top five. Dani Pedrosa (Repsol Honda Team) was sixth quickest, going safely through despite a low drama tip off at low speed in Sector 1. Jorge Lorenzo (Ducati Team) was also an improver in FP3 in terms of laptime and took P7, just ahead of another crasher in FP3 – Johann Zarco (Monster Yamaha Tech 3). The Frenchman also crashed on Friday but escaped harm in both cases. Michele Pirro (Ducati Team) goes through in ninth, not improving on Saturday as yet but having shown great pace on Friday as he wildcards for the Borgo Panigale factory. Aleix Espargaro (Aprilia Racing Team Gresini) did improve, taking tenth and knocking out Andrea Iannone (Team Suzuki Ecstar), who will now head through to Q1. Tito Rabat (EG 0,0 Marc VDS) was another man who lost out after being in the top ten on Friday, and Jonas Folger (Monster Yamaha Tech 3) wasn’t able to move up the timesheets.